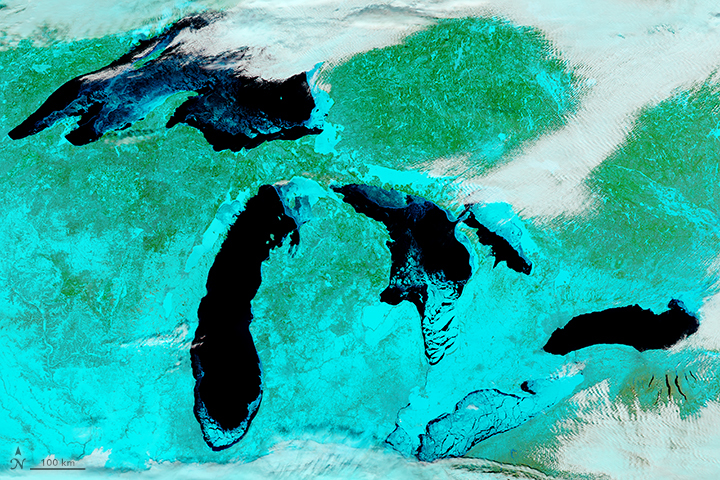 It is frigid in much of Canada and the Midwestern and Eastern United States. Daily low-temperature records have dropped like snowflakes. New Year’s polar plunges have been canceled due to the cold, and many people in the Southeast are in a battle to keep their pipes from freezing. 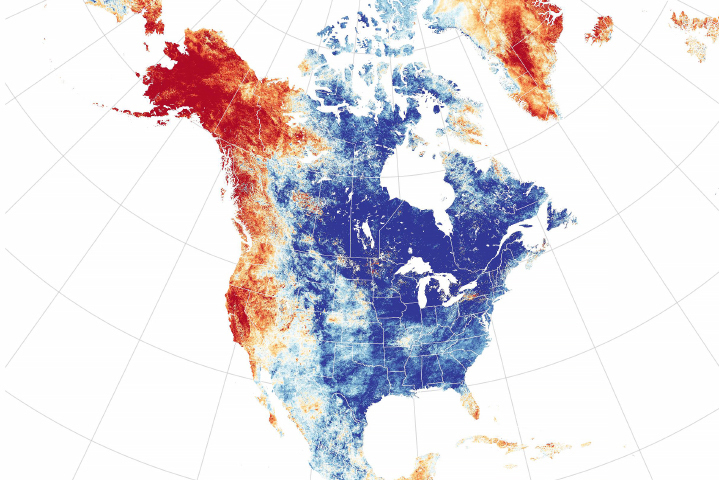 The map of North America underscores one of the realities of weather—when a cold snap hits one region, warmth often bakes another one. A giant meander (or Rossby wave) in the jet stream is the common thread that connects the warm weather west of the Rockies with the chill east of them. 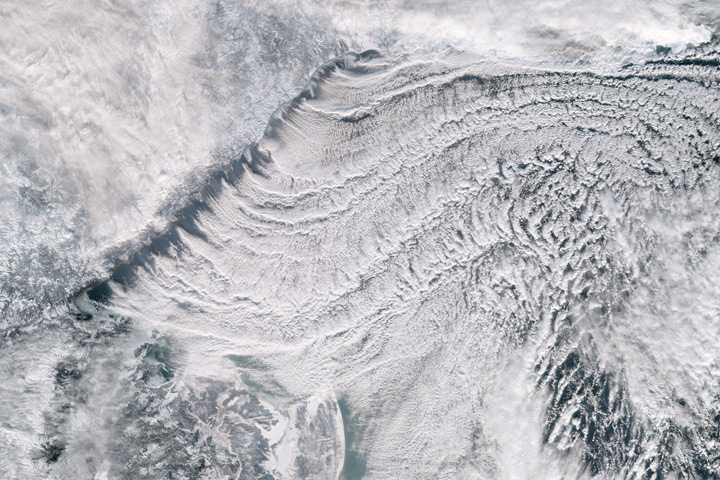 As the crest of a Rossby wave—a ridge—pushed unusually far toward Alaska in December, it dragged warm tropical air with it. 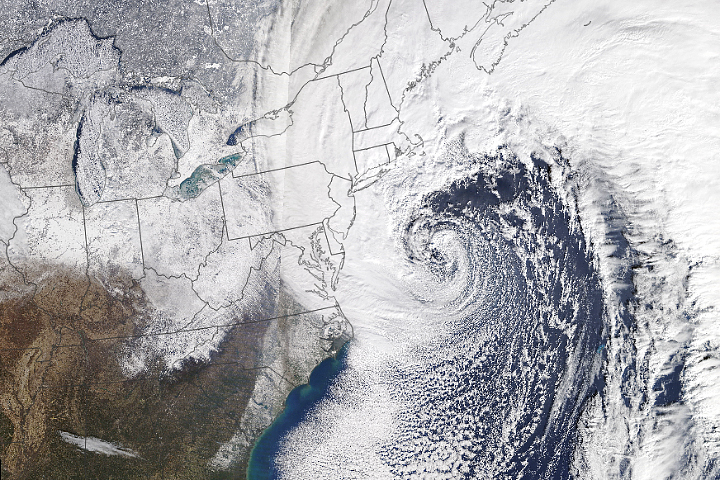 In response, the other side of the wave—a trough—slid deep into the eastern United States, bringing pulses of dense, cold Arctic air south with it. 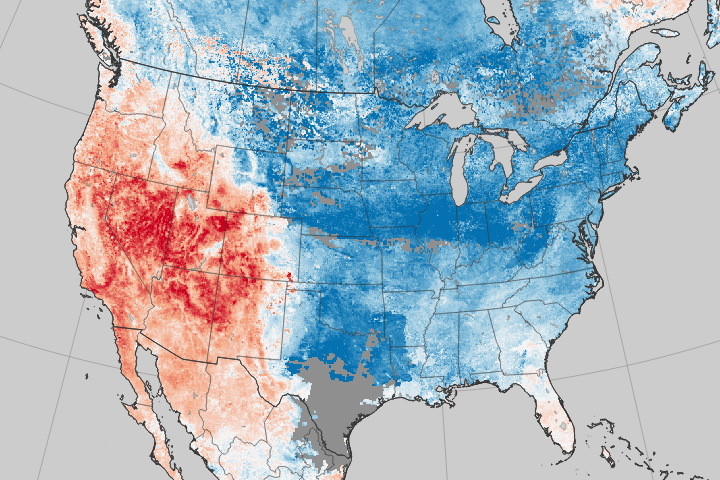 The Rocky Mountains have boxed in much of the coldest, densest air, serving as a barrier between the cold and warm air masses. Even as the Eastern U.S. freezes, comparatively balmy conditions are dominating many other parts of the world. 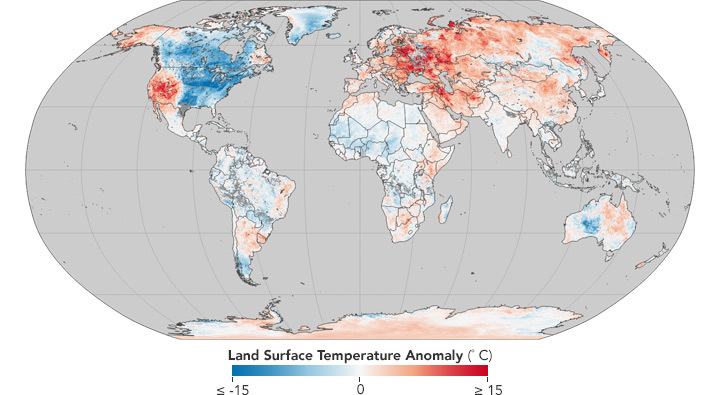 Europe, much of Asia, and the Middle East have been abnormally warm. In the southern hemisphere, Antarctica, eastern Australia, southern Africa, and the Horn of Africa have been warmer than usual, while the Amazon in South America, the Sahara in Africa, and western Australia were cool. 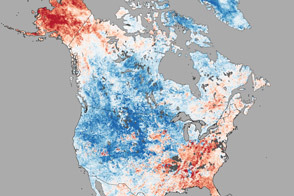 NASA Earth Observatory maps by Jesse Allen, based on MODIS land surface temperature data provided by the Land Processes Distributed Active Archive Center. Story by Adam Voiland. 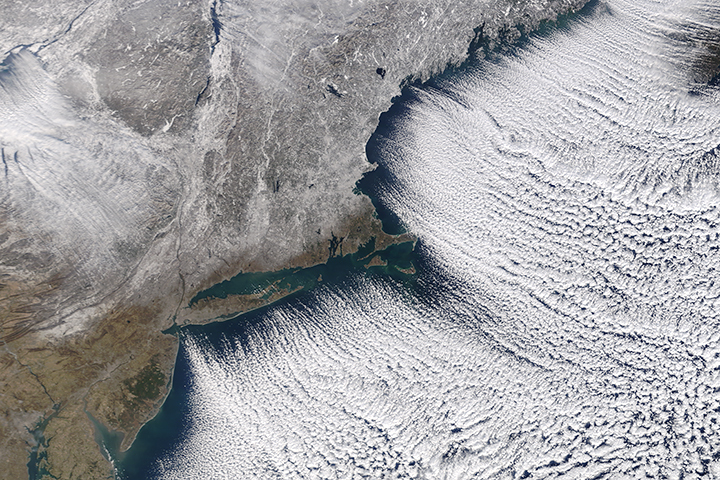 Large waves in the atmosphere mean that a cold snap in one area is often accompanied by unusual warmth in another. Cliff Mass Weather Blog (2018, January 1) Northwest Mountains Protect Us From the Cold. Accessed January 3, 2018. Forbes (2017, December 8) A Response For People Using Record Cold U.S. 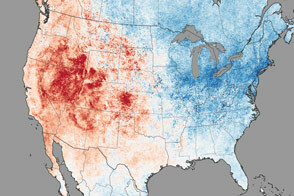 Weather To Refute Climate Change. Accessed January 3, 2018. 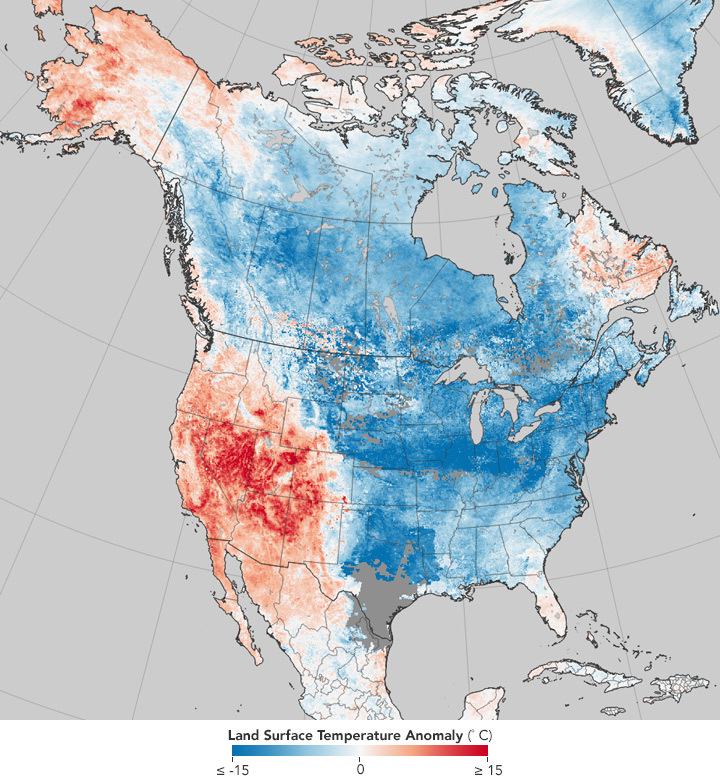 The Los Angles Times (2017, December 28) As bitter cold racks Northeast, California enjoys nation's warmest weather. Accessed January 3, 2018. 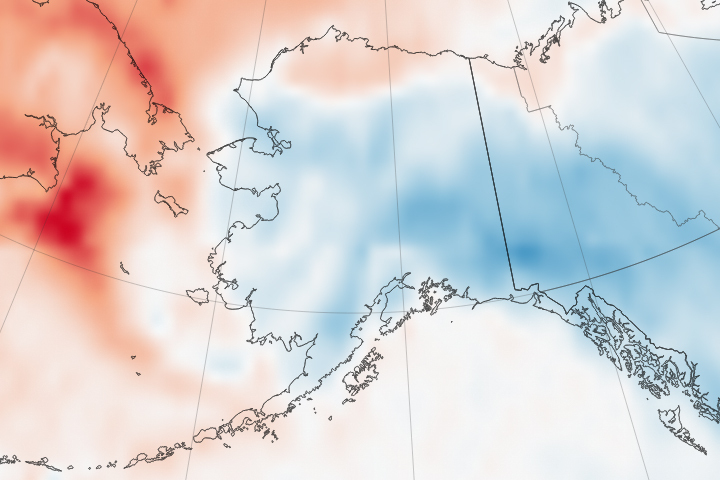 USA Today (2018, January 2) Baked Alaska: USA's northernmost state has been unusually warm. Accessed January 3, 2018. Voice of America (2018, January 2) T-shirts in Alaska in Winter? With Record-Tying Temps, Yes. Accessed January 3, 2018. 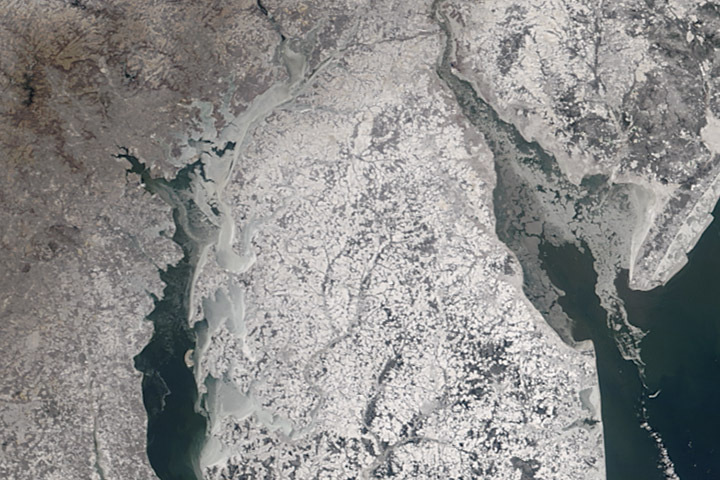 Weather Underground (2018, January 2) Year-End Arctic Chill Persists; Ice and Snow Loom from Florida to Maine. Accessed January 3, 2018.